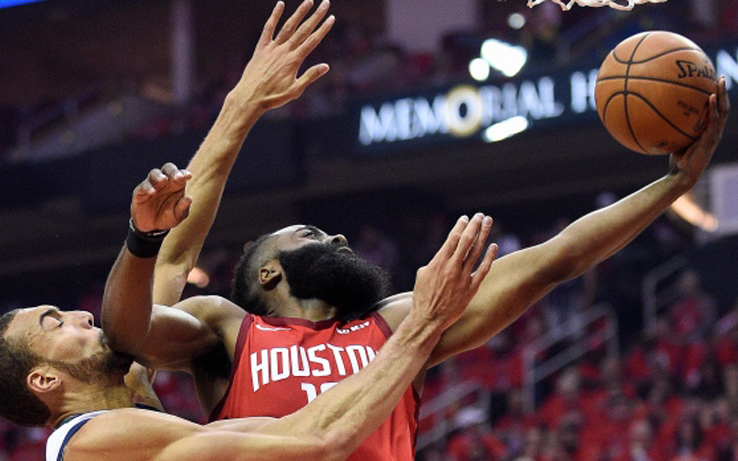 The NBA announced that Houston Rockets guard James Harden was named KIA NBA Western Conference Player of the Month for games played in March and April. It is his third time winning the award this season, and the eighth of his career, all coming as a Rocket. The Rockets were 16-4 over the final two months of the regular season, posting the highest-winning percentage in the NBA. Houston outscored opponents by an average of 12.8 points in those games with Harden recording a league-best plus/minus rating of +241 over that span. Harden scored more points (696) than minutes played (695) over the final 20 games and nearly accomplished that feat for the season (2,818 points in 2,867 minutes played). Harden finished the season averaging 36.1 points, 7.5 assists, 6.6 rebounds and 2.03 steals. He became the first player in NBA history to have averaged at least 35.0 ppg and 7.0 apg in a single season and joined Michael Jordan (1988-89) as the only players to have averaged at least 30.0 ppg, 7.0 apg, 6.0 rpg, and 2.00 spg. Over a span of 40 games played from Dec. 8 through March 8, Harden averaged 40.1 ppg, 7.1 apg, 7.0 rpg and 2.2 spg. According to the Elias Sports Bureau, that was the second-longest span of averaging 40+ points in NBA history. The Rockets were 28-12 in those games despite Clint Capela missing 14 of those games, Eric Gordon missing nine, and Chris Paul missing 18. The Rockets were 12-14 through games played on Dec. 12 and had the second-lowest winning percentage (.462) in the Western Conference. Harden scored 50 points against the Los Angeles Lakers on Dec. 13, marking the first of 32 consecutive games scoring at least 30 points which is the second-longest in league history. From the start of Harden’s streak through the end of the regular season, Houston had the second-best winning percentage (.732) of any team. Harden led the NBA in scoring by 8.09 points per game, marking the highest differential between the league’s top two qualified scorers since Wilt Chamberlain outscored Elgin Baylor by 10.84 ppg in 1962-63. Harden scored 40+ points 28 times this season, including 50+ nine times, and 60+ twice. The Rockets won 75% of his 40-point games (21-7 mark). The seven-time All-Star surpassed his career high for 3-pointers made in his 53rd game of the season and finished with 378, marking the second-highest single season total in NBA history. Harden hit a franchise-high tying 10 3-pointers in an overtime win at Golden State on 1/3, marking one of 10 games with at least eight this season. Harden also ranked second in the league in both steals (2.03 spg) and deflections (277) and nearly averaged a block per game dating back to Christmas. Last season, Harden was named the NBA’s Most Valuable Player after joining Jordan as the only players to have averaged at least 30.0 ppg, 8.0 apg, 5.0 rpg and 1.70 spg in a single season. In 2016-17, Harden finished second in MVP voting after joining Oscar Robertson as the only players to have averaged at least 29.0 ppg, 11.0 apg and 8.0 rpg in a single season. Harden also finished second in MVP voting in 2014-15. Dating back to 2014-15, Harden is averaging 30.4 points, 8.4 assists, 6.4 rebounds, and 1.8 steals with Houston winning 66% of the games he played in, including a league-best 72% going back to last season.